The majority of the time, a posterior vitreous detachment separates without complications. Like taking a piece of tape off a piece of paper, most of the time it comes off clean but sometimes it comes off with a tear. If a tear occurs in the retina, this can allow the natural fluid in the eye to enter and cause the retina to peel off (like wall paper coming off of the wall). 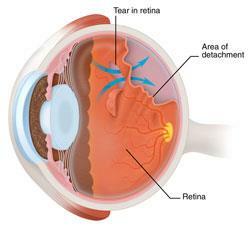 When the retina pulls away from the back of the eye, it is called a retinal detachment. The goal is to catch retinal tears before this happens so it can be treated so avoid surgery and/or blindness. WHO IS AT RISK FOR A TORN RETINA? •	Weak areas in the retina that can be seen by an ophthalmologist during an eye exam. (lattice degeneration). Having any of the above symptoms is concerning. Having more than one of the above symptoms represents an even higher risk. Do not hesitate to call to make an appointment if you are experiencing any of the above. Retinal tear or retinal detachment is diagnosed with a dilated eye examination. In some cases an ultrasound of the eye may also be performed if the retina cannot be visualized due to bleeding, poor dilation, or some other reason. However, if the retina has detached then surgery is required to re-attach the retina.